Positioned at the top of the terrestrial food chain, the Galapagos hawk is an apex predator and an excellent hunter. The Galapagos hawk is closely related to North America’s red-backed and white-tailed hawks, and is endemic to the Galapagos Islands. It is one of the world’s rarest raptors, with an estimated population of just 150 breeding pairs. They are common on the main islands in Galapagos, where the adults can easily be recognised by their dark brown, sometimes almost black plumage. Juvenile hawks on the other hand are much paler, with their cream plumage providing camouflage to hide them from potential predators until they reach maturity. 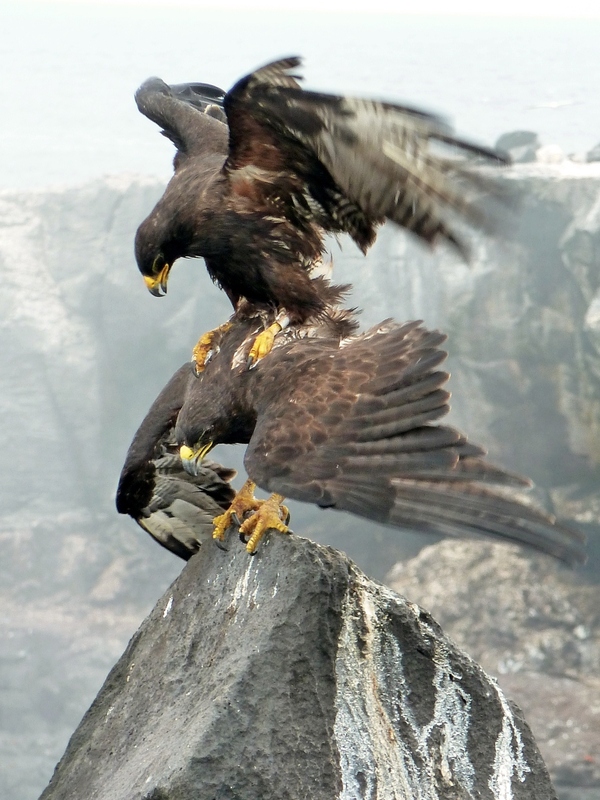 Adults have an average wingspan of 120 cm, with a broad tail and strong talons. 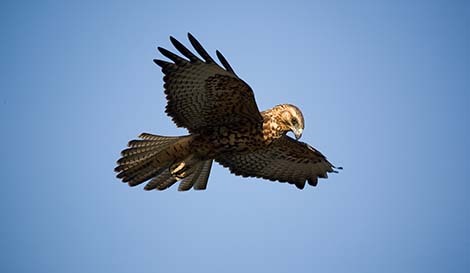 As with many birds of prey, females tend to be larger than males. Galapagos hawks mainly feed on invertebrates such as giant centipedes and locusts, but also occasionally predate snakes, rodents, lizards, young iguanas, turtle hatchlings and other birds. They are also some of the major scavengers in Galapagos, feeding off carcasses using their strong beaks. The Galapagos hawk has quite a unique breeding system known as cooperative polyandry. Although the males are entirely monogamous, the females can mate with up to seven males throughout the nesting period. These males then help to raise the chicks (usually three in a clutch) by taking turns incubating eggs and feeding the hatchlings. The nests are usually situated low in trees, on lava ledges or on the ground. 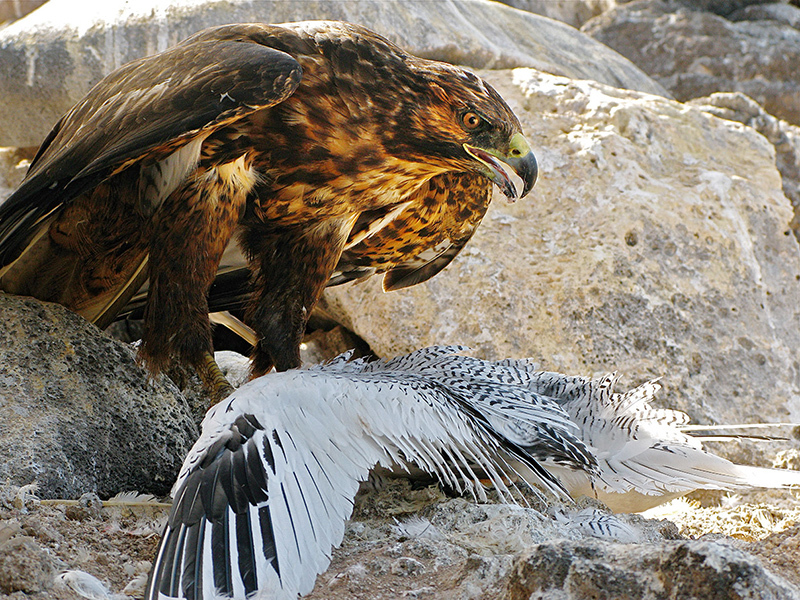 The hawks are very sensitive to human disturbance – often abandoning the nest if it is tampered with by humans. Galapagos hawks are thought to be relatively recent arrivals in the Galapagos. DNA analysis suggests that they colonised the Islands approximately 300,000 years ago. Where to see them: They are mostly seen on the main islands such as Isabela and Fernandina, but they are extinct on the islands Baltra, Daphne, Floreana, San Cristobal and Seymour. When to see them: They nest all year round on the major islands so they can be seen at any time of year. Threats: The introduction of cats by humans has caused a drop in numbers due to competition for food. Disturbance caused by the arrival of humans on the Islands also caused a large drop in numbers, from which the population still hasn’t fully recovered. 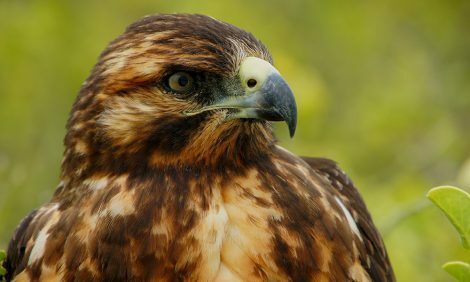 Conservation action: The Galapagos hawk has been under protection by Ecuadorian law since 1959 and has now been protected from international trade due to its endangered status. The Galapagos Islands have a National Park that covers 97% of its land space, protecting the land in which the Galapagos hawk lives, and is a UNESCO World Heritage Site.